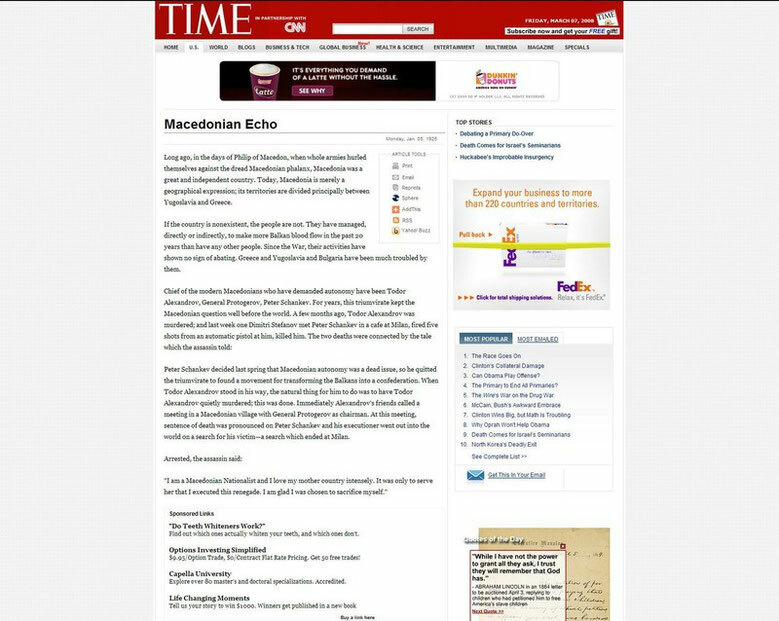 Macedonian Echo-Times - republic-of-macedonias jimdo page! If the country is nonexistent, the people are not. They have managed, directly or indirectly, to make more Balkan blood flow in the past 20 years than have any other people. Since the War, their activities have shown no sign of abating. Greece and Yugoslavia and Bulgaria have been much troubled by them. Peter Schankev decided last spring that Macedonian autonomy was a dead issue, so he quitted the triumvirate to found a movement for transforming the Balkans into a confederation. When Todor Alexandrov stood in his way, the natural thing for him to do was to have Todor Alexandrov quietly murdered; this was done. Immediately Alexandrov's friends called a meeting in a Macedonian village with General Protogerov as chairman. At this meeting, sentence of death was pronounced on Peter Schankev and his executioner went out into the world on a search for his victim—a search which ended at Milan. "I am a Macedonian Nationalist and I love my mother country intensely. It was only to serve her that I executed this renegade. I am glad I was chosen to sacrifice myself."